What if someone told you that little brown bottle of first-aid water under your bathroom sink could lighten your hair as well! Well yes, hydrogen peroxide or the first-aid water (as it is ideally known) could do a lot more than just fizz up and disinfect a wound! If you’ve ever had your hair dyed in a salon, you may have noticed your colorist using a product that has hydrogen peroxide as its main component, thanks to its bleaching properties. But hey, hair is not the only area you can it on. 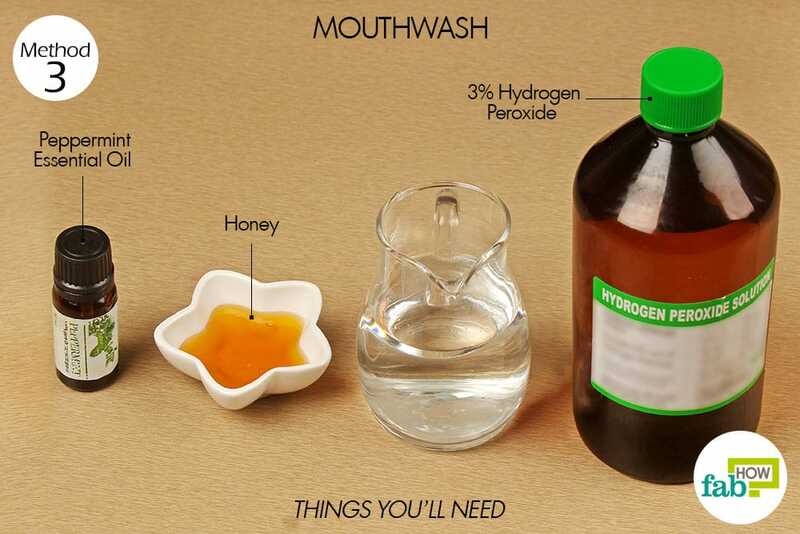 Being a traditional antiseptic, you can use hydrogen peroxide for skin, teeth, hair and ears. And if someone told you that these beauty hacks were overlapped by health benefits as well—voila! Not only beauty, hydrogen peroxide is also the only germicidal agent containing water and oxygen, which is an ideal disinfectant. 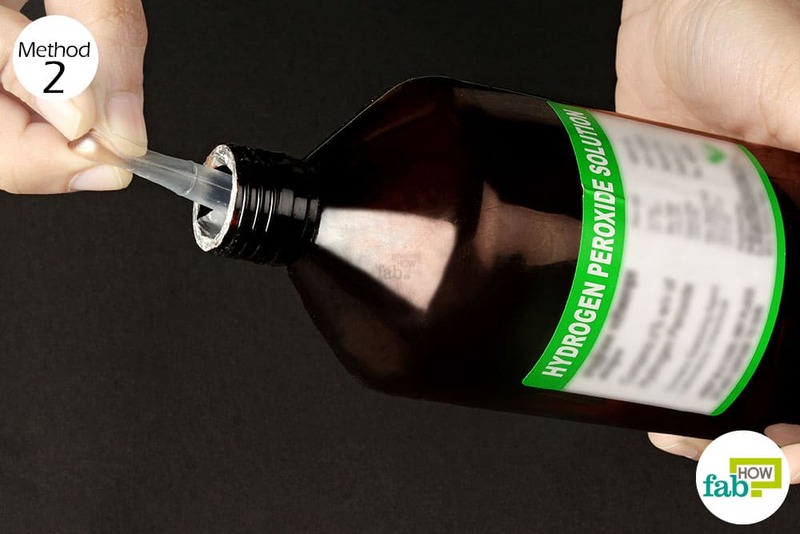 With its power of oxidation to kill germs and microorganisms and eliminate toxins, hydrogen peroxide is now hailed as the world’s safest all-natural sanitizer. A panacea for health and beauty in one single bottle—hydrogen peroxide definitely deserves a spot in your vanity. Although this may not make your health and beauty regime go natural, it can definitely make it inexpensive and less cluttered. So, let us have scroll into some of the most amazing ways to use hydrogen peroxide to boost your health and beauty. Hydrogen peroxide is an effective over-the-counter antiseptic that helps dry out acne breakouts by killing the bacteria on the skin. Composed of oxygen molecules, hydrogen peroxide helps oxygenate the pores that develop into acne. This creates an aerobic environment in the skin, difficult for the bacteria to thrive in, thus killing them to prevent potential pimples. Note: Perform a patch test before proceeding with the remedy. In case of severe itching, redness, or burning sensation, stop the treatment right away. 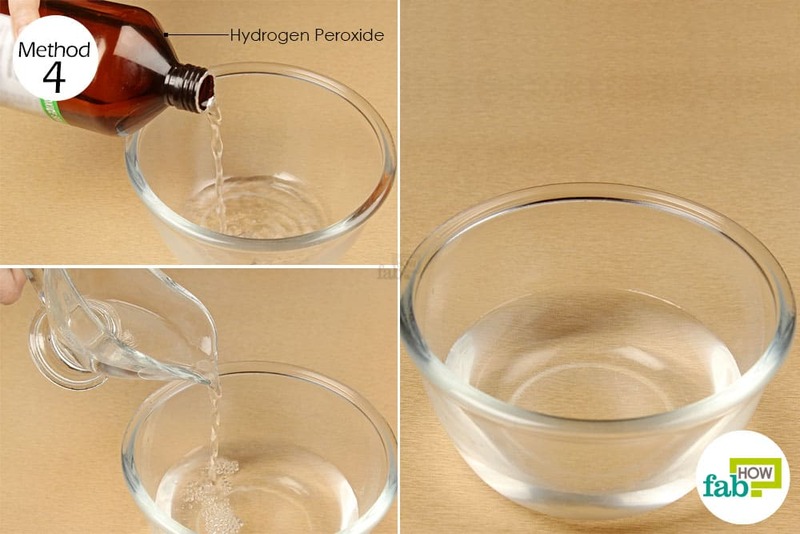 Pour some diluted solution of 3% hydrogen peroxide in a bowl. Soak a cotton ball in the solution and apply it directly on the acne breakouts. As you apply the chemical solution on the skin, it starts to bubble. Wait until the bubbling stops (it may take up to 2 minutes). Finish with a good moisturizer to prevent the skin from drying out. 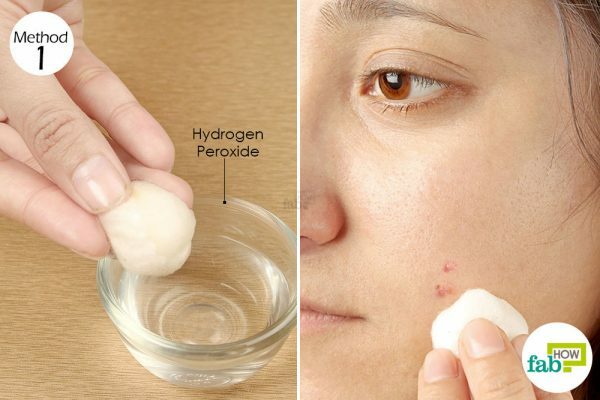 Apply diluted 3% hydrogen peroxide once daily for 1 week to get rid of acne completely. The 3% solution of hydrogen peroxide is mostly safe on the skin and can be used as a toner to prevent further breakouts. 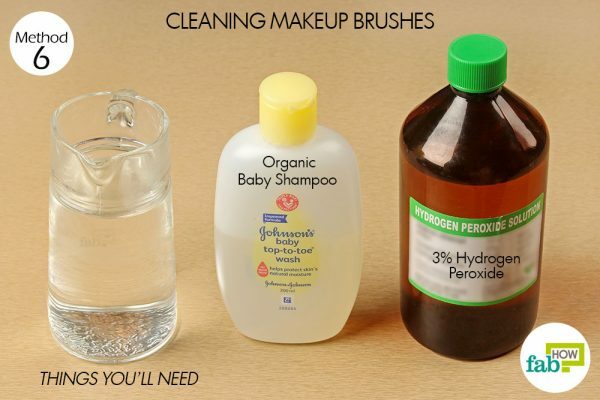 You can use hydrogen peroxide as a powerful remedy if suffering from earache or struggling to clear out the wax. The oxygen molecule of peroxide oxidizes the earwax to bubble up and soften, thus letting it out of the ear easily. 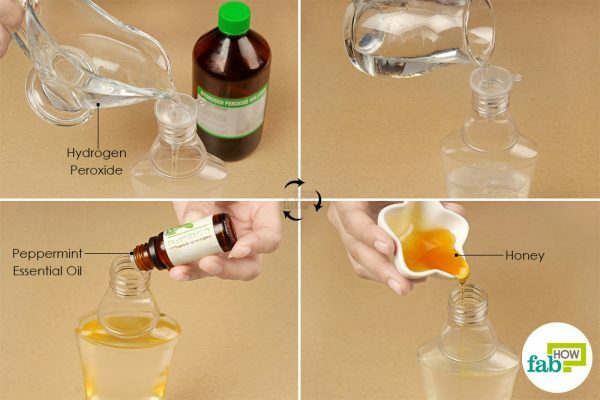 This attribute of hydrogen peroxide makes it an essential chemical in most formulations for ear problems. Fill a syringe with 3% hydrogen peroxide solution. Lie down on your side, with the aching ear facing up. Pour anywhere from 2 to 4 drops of hydrogen peroxide into the aching ear. Allow the peroxide to stay in the ear for 10 minutes. You will hear bubbling and fizzing as the peroxide works magic in your ear. Rise and hold your ear over the sink to drain out the wax. Grab a towel or tissue to blot and wipe of any remaining wax. Repeat the process for the other ear if needed. Follow with a final rinse of the ear with clean water. For this, fill a syringe with clean water and follow the same process as mentioned above. 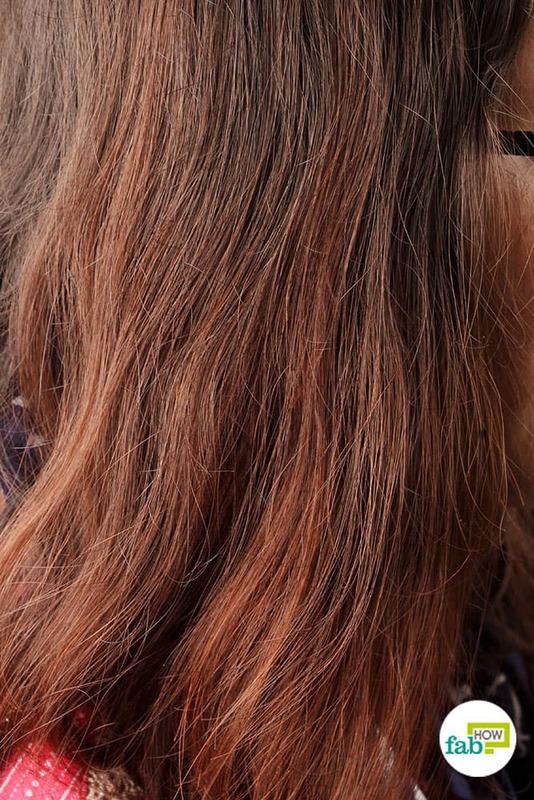 Hydrogen peroxide will clean out your ear in a single use. You can repeat the process for 2 to 3 days if the ear still feels clogged and if the pain persists. Thanks to the antifungal properties, hydrogen peroxide works as a powerful antidote. The presence of hydrogen and oxygen molecules makes it ideal for killing off fungus and bacteria from the skin. Hydrogen peroxide releases oxygen bubbles that create an aerobic environment, which makes it difficult for the anaerobic bacteria to thrive in, thus ultimately killing them. 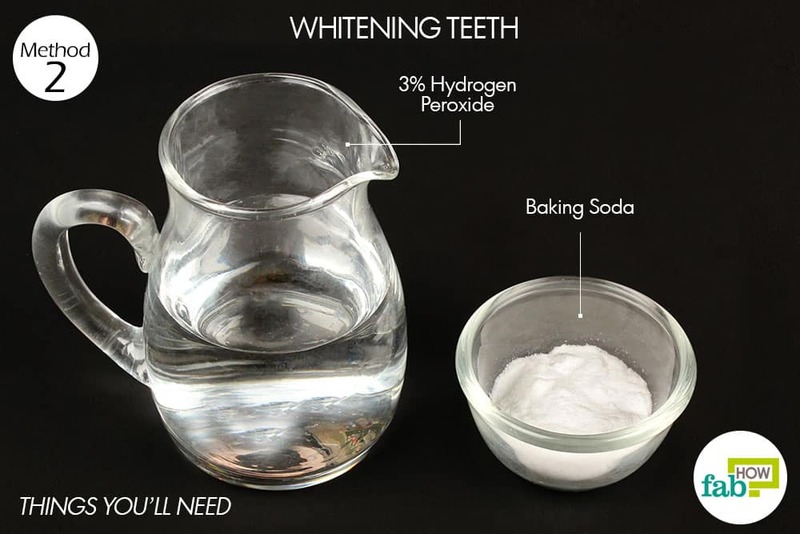 Dilute 3% hydrogen peroxide in an equal portion of water. Using a cotton ball swab the solution on the affected nail. Let air dry completely before rinsing off with lukewarm water. Repeat once or twice a day, especially before going to bed at night, for a couple of months. Alternatively, for toenail fungus, you can prepare a foot soak with similar ingredients in the ratio of 1:1, and soak the affected feet in the solution for 20 to 30 minutes. A natural disinfectant, hydrogen peroxide works charms to heal cuts and wounds. In the similar context, hydrogen peroxide proves beneficial as a medicated rinse to heal and provide relief in canker sores. 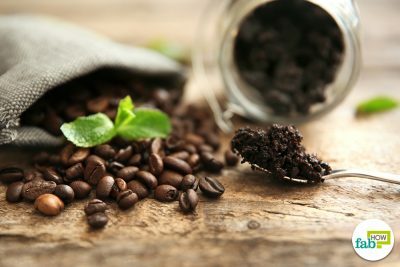 It also prevents the infection from recurring and promotes better healing. Pour ¼ cup of 3% hydrogen peroxide into a glass. 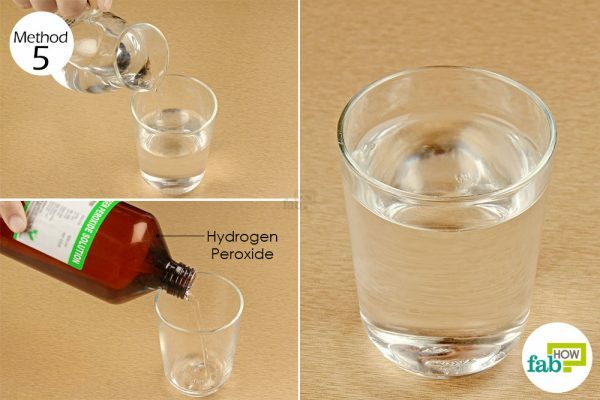 Add an equal amount of water into the glass to dilute the hydrogen peroxide. 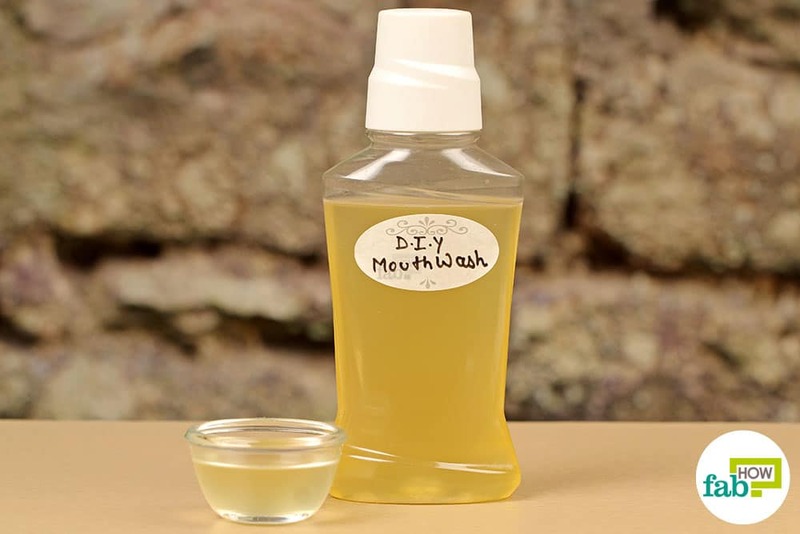 Swish the solution around the sores in your mouth for up to 1 minute before spitting it out. Use the entire solution this way. Do not swallow the liquid as it may cause nausea and upset stomach. 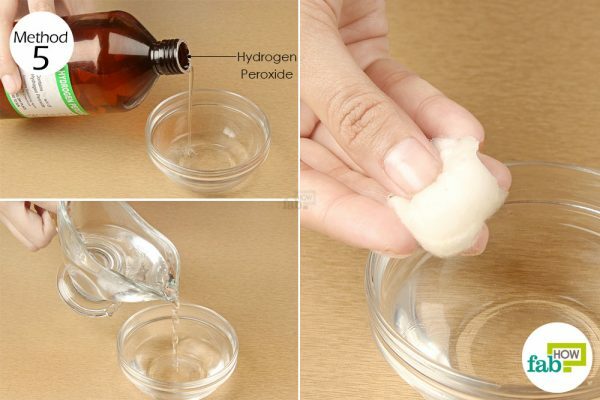 Use hydrogen peroxide remedy 3 times a day for 1 or 2 days or until the canker sores heal completely. 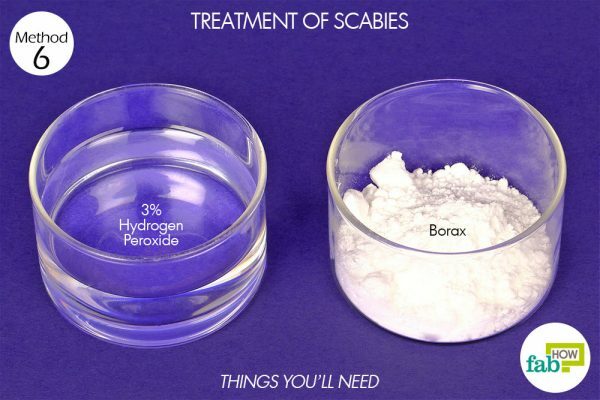 Using hydrogen peroxide in combination with borax works effectively to deal with scabies outbreak on the skin. While hydrogen peroxide is an effective bactericidal, borax works as an efficient insecticide and fungicide to kill itch-causing mites that lead to scabies. The combination works great to prevent the infection and reduce itchy rashes and inflammation. 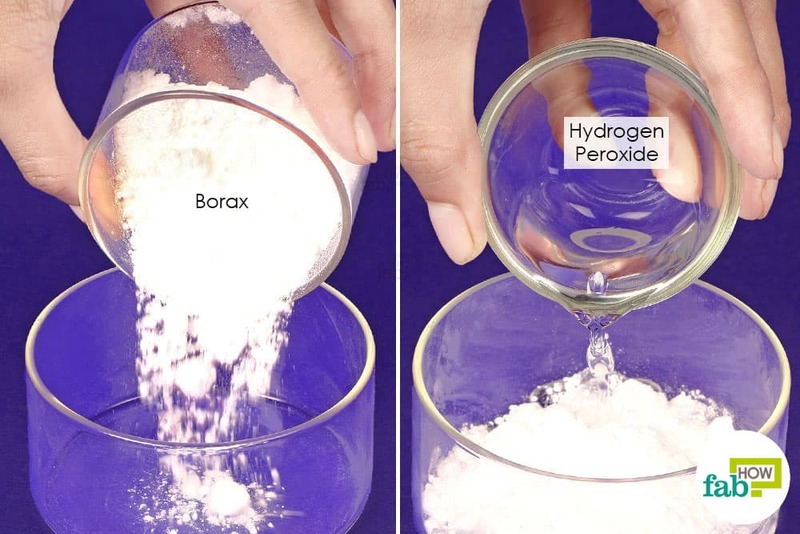 Combine borax and hydrogen peroxide in the ratio of 2:1. 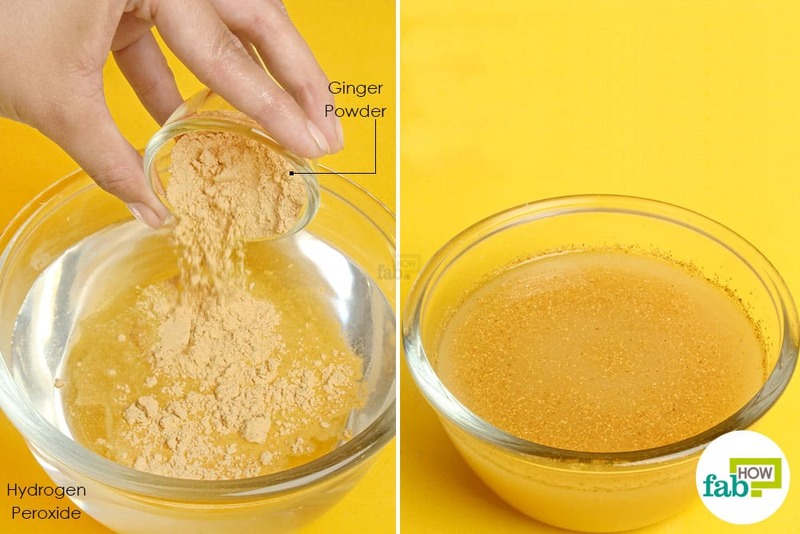 Apply the mixture on the skin affected with scabies. Allow the paste to dry for 15 minutes before rinsing off with lukewarm water. Use the mixture 2 times daily for 2 weeks to get rid of scabies. If you’ve ever had your hair bleached in a salon, chances are your colorist used hydrogen-peroxide bleach. 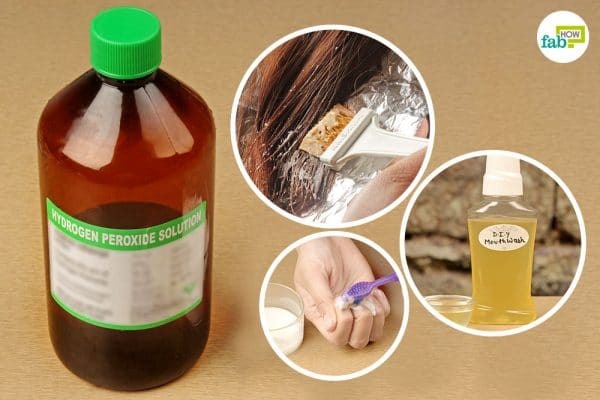 A natural bleach, hydrogen peroxide is one effective home remedy for dyeing and lifting the color of your strands to your own liking. It is in fact for this reason, hydrogen peroxide-bleached hair is also called peroxide blonde. 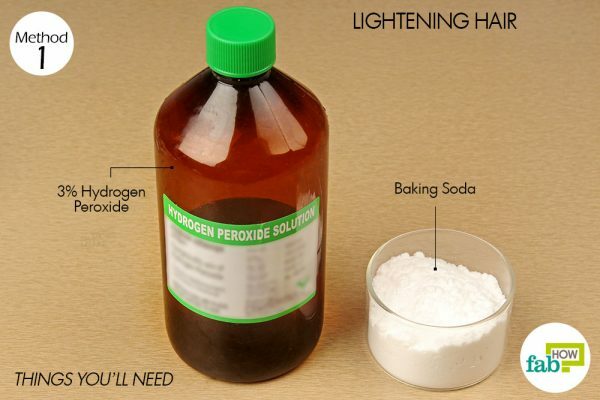 A mix of baking soda and hydrogen peroxide is a powerful and instant remedy for lightening your hair. Note: Before proceeding with the hair lightening technique, we recommend you to perform a strand test. This will help you ensure that you like the color and if it is not too damaging to your hair. 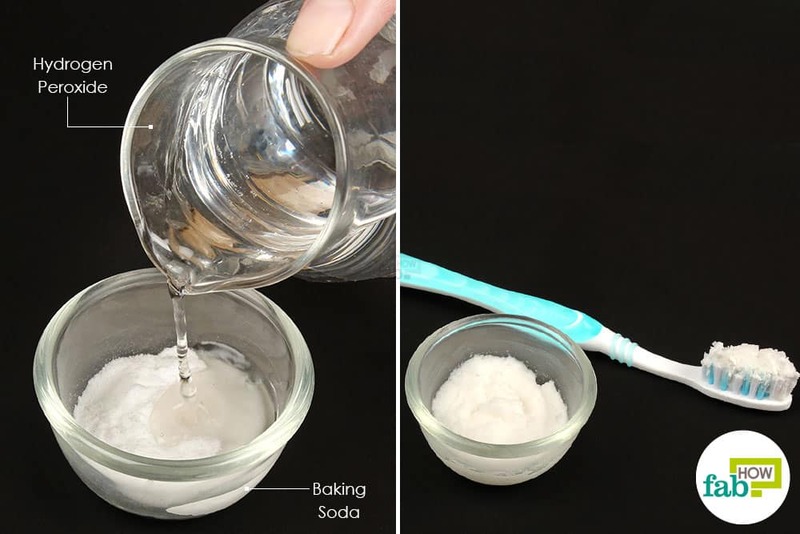 Pour 2 tablespoons of baking soda in a bowl. 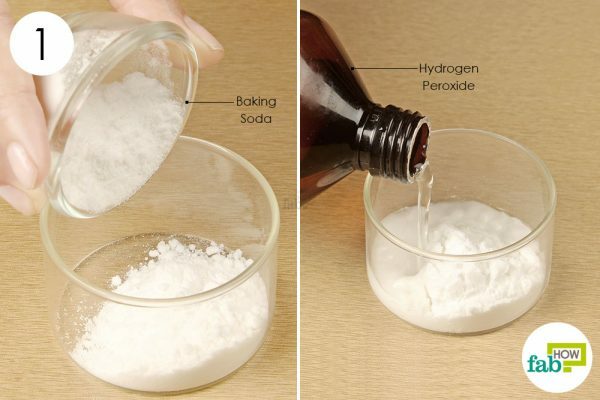 Add 1 tablespoon of hydrogen peroxide to baking soda. Combine the ingredients together to form a smooth and runny paste. Wash and condition the hair normally. Snip a section of your hair while it is still damp (or the whole of hair if you want the color globally) and spread aluminum foil underneath. Using an applicator brush, apply the paste to your hair. 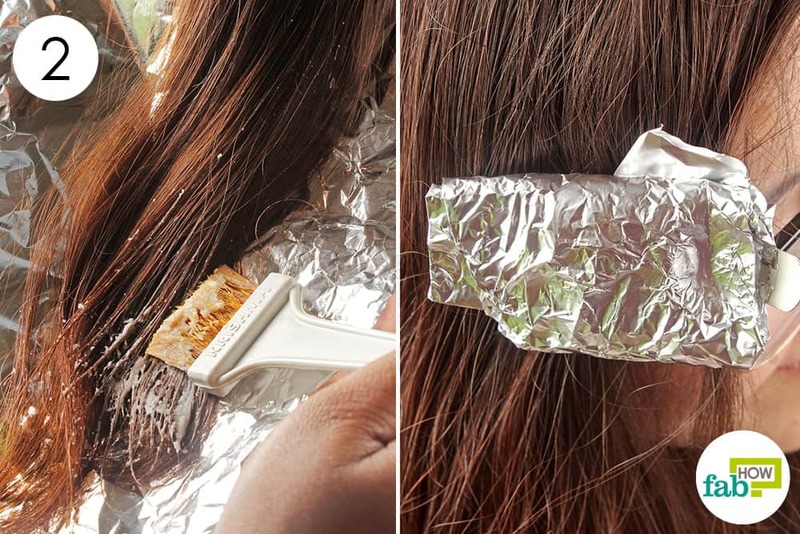 Roll up the aluminum foil and cover your hair to provide warmth and improve the lightening effects. Leave the paste on your hair for 30 to 60 minutes (depending upon the intensity of color you desire). Do not leave it for more than an hour or you may be at a high risk of damaging your hair. Rinse the paste out of your hair with normal water. Gently shampoo your hair followed by a deep conditioner. Lightening dries out your hair, therefore, it is very important to deep condition your hair. Allow your hair to air dry. Do not use a hair dryer or any other heating equipment to dry the hair as this may damage your hair largely. It may happen to you some time that you wear some nail color and at the time you want to take it off, the pesky stuff doesn’t just come off! Hydrogen peroxide is one quick and simple way to make your nails look squeaky clean and shiny. 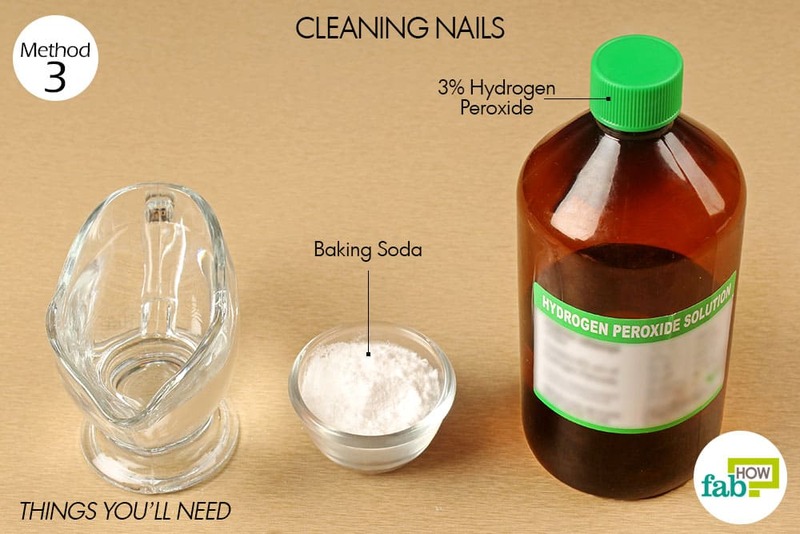 Mixing hydrogen peroxide with baking soda creates an effective scrub for removing stains from the nails and imparting a shiny look. Add an equal portion of hydrogen peroxide to it. Combine the ingredients together to form a smooth paste. Using an old toothbrush, scrub the paste into your fingernails and toenails. Pour some water in a bowl. 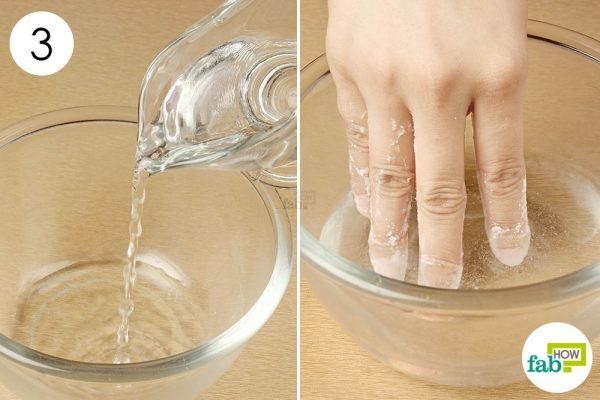 Soak the nails for 5 to 10 minutes, gently rinsing off all the mixture. Finish with a final rinse in warm water to get clear nails. Scrubbing your nails with baking soda and hydrogen peroxide paste will give immediate results. Note: Do not use this remedy more than once a month, as both ingredients are powerful and can turn your nails brittle if overused. If you are sick or feeling tired, give your bathwater a detoxifying boost for a refreshing experience that will also clear you off all toxins and germs from your body. Oxygen detox bath is specifically helpful in this case. The oxygen molecule from hydrogen peroxide helps eliminate toxins from the body while also creating an aerobic environment that makes it difficult for the free radicals and toxins to flourish. Adding ginger to an oxy-detox bath works charm. An anti-inflammatory and healing agent, ginger is specifically helpful in times of illness as it clears off congestion to alleviate body aches, allergies, and any kind of irritation. 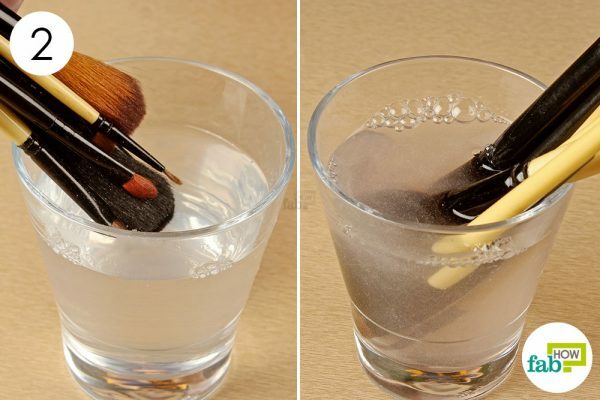 Put 2 tablespoons of ginger powder in 2 cups of 35% hydrogen peroxide and dissolve. 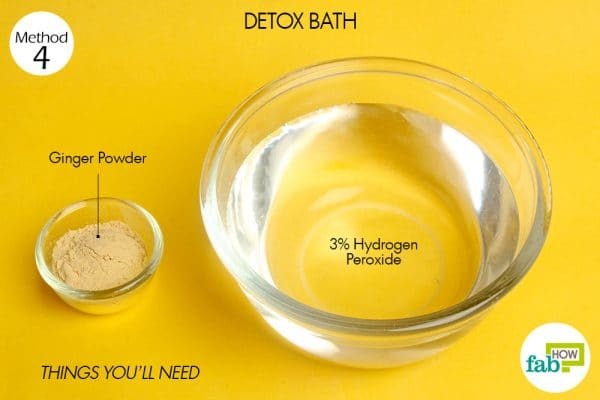 Pour the solution into your hot bath water. Soak in the tub for 30 to 40 minutes. Finish with a final rinse in normal water. Prepare and soak in the detox bath water once or twice a week. 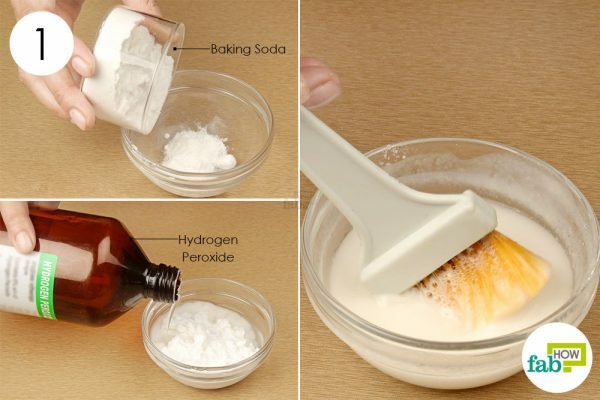 You can also use hydrogen peroxide as an effective treatment for blackheads and whiteheads on your skin. Blackheads and whiteheads mostly occur when the skin gets clogged with oil. This is where hydrogen peroxide proves effective. It dissolves the blackheads to eliminate them from your skin. Dilute 3% hydrogen peroxide with an equal amount of water. Scrub your face gently to exfoliate the dead skin cells. 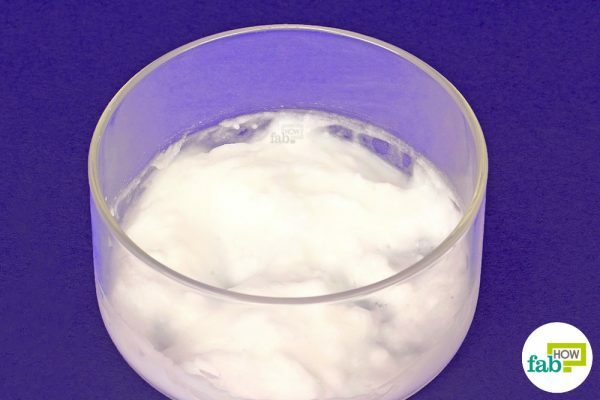 Saturate a cotton ball in the solution and dab it on your blackheads and whiteheads. Leave it overnight and rinse off the next morning with normal water. Finish with the application of oil to moisturize your skin. You may use olive oil, coconut oil, or jojoba oil for this. Follow the activity 2 times every week for up to 2 weeks to observe satisfactory results. Often, your make up brushes may look clean, but the bristles are porous and harbor several oils and bacteria that may harm your skin. 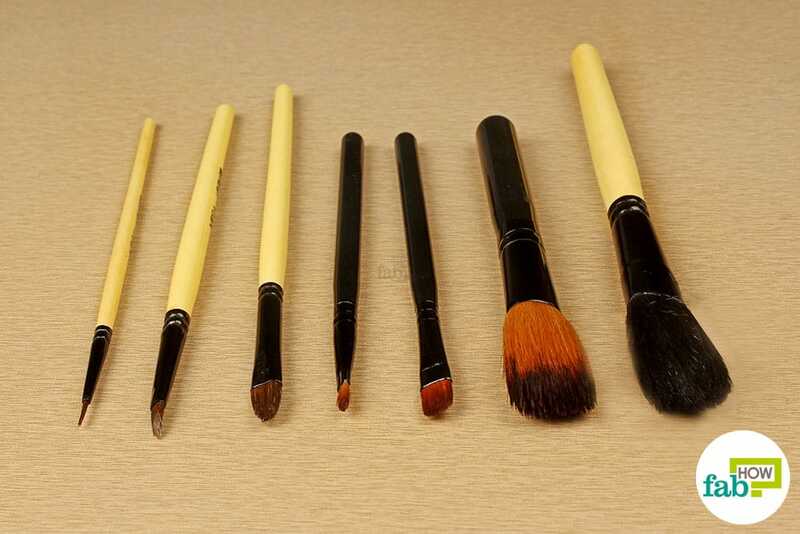 With each use, the makeup brushes pick up dead cells and bacteria from your face. These bacteria multiply overtime to cause acne and breakouts on the skin. Hydrogen peroxide as an antibacterial helps kill off this bacteria harboring on the brushes that often goes unnoticed. Adding organic baby shampoo or castile soap to the solution adds an ample amount of olive oil to the bristles of the brushes, thus making them softer on your skin and cleaning them better. Pour some hydrogen peroxide (about 2 tablespoons) in a glass or bowl. Add an equal amount of water to it. 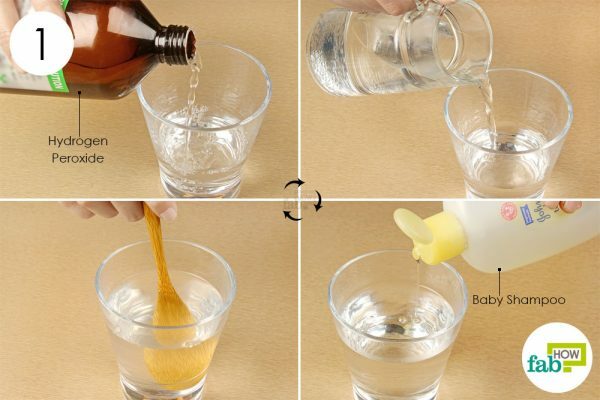 Add a few drops of baby shampoo to the water. 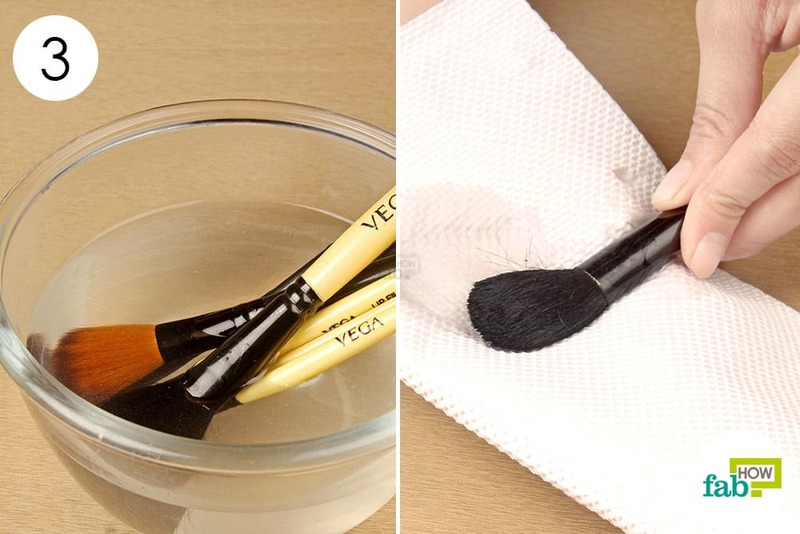 Swish the brushes in the solution and allow them to sit for up to 10 minutes. Remove the brush from the solution and soak them in normal water. Grab a paper towel and wipe down the brushes to remove any excess moisture. Lay the brushes flat and allow them to dry.